For more than a century, First United Methodist Church of Fort Pierce has withstood the test of time in its mission to carry out the teachings of Christ: To feed the hungry, make disciples and give without asking for anything in return. This community of the faithful has weathered through thick and thin, namely social change and multiple relocations. Their motto, You Matter to God and Us, is evident in their abundance of outreach programs and local partnerships. From humble beginnings in 1888 when two women held Sunday school in the local school house, First UMC values its sense of place. Although the church is not the oldest in the area, its endurance is noteworthy. “We consider our beginnings to be when the first minister was hired in 1892,” church historian Joan McClenny says. The first sanctuary was built in 1895 on the southeast corner of U.S.1 and Seaway Drive. “A marker is there somewhere under an oak tree,” McClenny says. And as the membership grew, a larger facility was needed. So in 1900, a new church was built on the west side of Pine Street (presently Second Street), south of Tickle Tummy bridge, on the site of what is used as overflow parking for the downtown Farmer’s Market. According to the local reporter of the day, Charles S. Miley, the church later moved to North Seventh Street next to the cemetery. The present sanctuary at Orange Avenue and Seventh Street was built by C.E. Cahow in 1924 and 1925 at the peak of the Florida land boom. At that time, it was dedicated as Hendry Memorial Methodist Church in memory of its beloved and aging pastor, the Rev. John A. Hendry, who died before its completion. The first worship service was held on Easter Sunday, April 4, 1926. Featuring design appointments of the Mediterranean Revival period, the structure is a picture postcard of the city’s historical past and one of many designed by William Wesley Hatcher, grandfather of church member, Kathy Kruger, and architect for Old City Hall and the Raulerson Building. Although elements of the chancel have changed, the main building is in its original 1925 style. In 1944, the church was renamed First Methodist Church. The pre-World War II years saw an opportunity for more growth and outreach with a Navy installation added on Hutchinson Island as tens of thousands of young men trained for combat on the protected barrier island. A decade later, an expansion added more seating, a larger chancel and two side rooms to accommodate the 2,201 pipes of an acquired 1923 Aeolian Opus 1523 organ. This particular organ — although the church purchased only the pipes — holds significance for its unique provenance: It was a prominent feature of the Dodge winter estate in Palm Beach, Dodge being Horace and his brother, John Francis Dodge, who together founded Dodge Brothers Motor Car Co., known today as the Dodge brand of cars. The Florida humidity is hard on the pipes and biannual maintenance requires a specialist who is from the Atlanta area. “No doubt about it, there is a lot of upkeep, but it sounds wonderful,” says McClenny. Organist Richard Lystra accompanies the sanctuary choir and occasional music soloists. A handbell ensemble rounds out the musicality of Sunday worship. In 1968, the name was changed again to First United Methodist Church following a merger with a local Church of the Brethren and is simply called First UMC. The Rosslow family has been involved since the 1970s when their children were in Betty Uhl’s preschool. Greg Rosslow, owner and proprietor of Rosslow’s fine ladies apparel store in the heart of downtown Fort Pierce, assisted Pastor David McEntire with YMCA sports: T-ball and soccer. He and his wife, Cindy, found support among other families there raising children. Now empty-nesters, they volunteer their time. “I feel a commitment to it apart from all the other things going on in our lives,” Rosslow says. The congregation is invested in their neighbors. They see no need to move out of the area and many members live nearby. With a focus on the future and a vision to watch God at work, the congregation strives to make a difference in the lives of people who seek them out, namely the homeless and neglected. Led by acts of mercy, their mission statement emphasizes their faith. Interim pastor Jeff Brinkman does not waver in his message of invitation. “We are friendly folks who welcome people to join us as we worship a loving God,” Brinkman says. Snowbirds from as far as England visit during season. “We have two wonderful pastors,” Rosslow says, adding that Brinkman is filling in for Tim May who is on an 18-month Navy deployment serving as a military chaplain in Djibouti, Africa. “It’s refreshing that both ministers have a personal connection with us.” Thoughtful of Brinkman, Rosslow comments with just one word: genuine. Two years ago, Brinkman retired after serving 30 years in ministry and moved with his wife to Vero Beach from the Midwest. 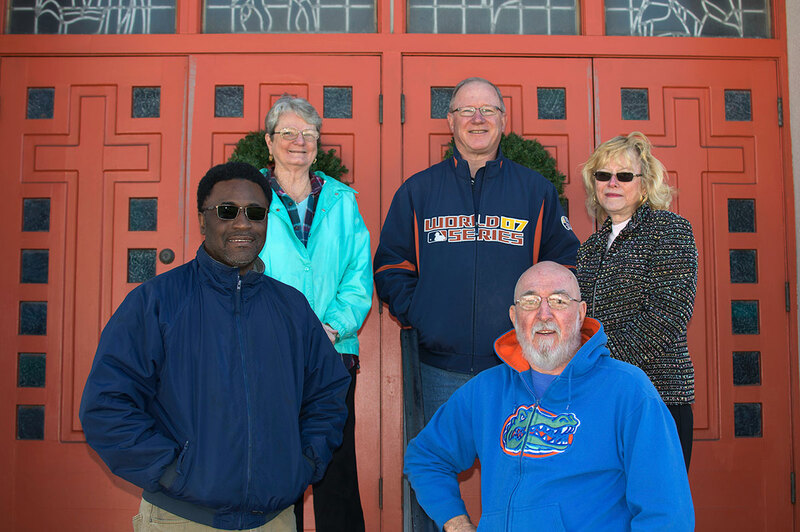 For months they searched out a church home and finally visited Fort Pierce. “We were there 10 minutes and we knew this was it,” he says. What is important to him as the pastoral guide is that people learn to live outside themselves. “Christianity is rooted in the love of others. Everyone has a role to play. We may retire from our jobs, but Christians never retire from being Christians. There is a sense of purpose for every individual, giving way for personal ministry to come alive,” he explains. Last spring, First UMC celebrated a milestone: its 125-year anniversary. The fete was organized by Joan and Len McClenny and a host of volunteers. Joan was undaunted by the voluminous task of sorting through church history. Armed with a copy of Centennial Reflections, a book that was written by Larry Adams for the centenary, and other sources, she was able to put together an overview of activities through the decades. With a solid commitment to the community, the church is home to the Multicultural Resource Center, a nonprofit, after-school program that aligns with the mission of First UMC to strengthen families by providing a safe environment for youth to experience enrichment activities. Church members participate by teaching middle school students life skills like cooking and sewing. Founded in 2009 by executive director Marcus Dixon, it is a grassroots, nonprofit agency. Dixon, a former unit director for the Boys & Girls Clubs, served in the Air Force. He says the program began in response to the pressing academic needs of children experiencing neighborhood detachment due to a low economic status. “We feel it is our responsibility to champion unconditional love — acceptance and understanding — in promoting strong families through the development of each child,” he explains. The church charters a Trail Life USA troop, a nationwide Christian outdoor adventure, character, and leadership program for boys and young men, also led by Dixon. As of 2017, there were 700 troops with 26,000 members in 48 states. The church hosts a covered-dish fellowship meal, open to everyone, the first Sunday of the month. One aspect of celebrating the rich history of First UMC was seen in October as the church partnered with Main Street Fort Pierce’s Ghosts of Fort Pierce Past’s west side walking tour. The church opened its doors, welcoming the public to the sound of the Phantom of the Opera on that grand organ while Len McClenny portrayed the endearing Rev. Hendry. Neighbors in the subsidized housing next door receive Linens of Love — gently used bedding — and attend a free community dinner held the last Wednesday of each month with breads and desserts donated by Publix. Grace Packs, a reusable Publix bag filled with donated food for the weekend, enough for three dinners and two breakfasts, are sent to Lawnwood Elementary School on Fridays. Partnering with Chester A. Moore Elementary, churchgoers prepare a teacher appreciation breakfast in the beginning of each school year and bring ice cream as a reading reward during the book fair. Annually, members contribute financially and volunteer at the Mustard Seed Ministries Thanksgiving meal, supplying 6,000 servings of mashed potatoes and turkeys. Once again, First UMC will host the annual St. Lucie County High School Art Show and the Backus Art Museum classes continue at the facility. Every summer, a popular morning art and music camp, taught by members Martha Cross and Kathy Kruger, is held for a minimal cost of $25 a week with room for about 80 girls and boys, ages 5 to 11. Children avail themselves to pottery, drumming and other fine arts instruction. There are times for fellowship and personal spiritual growth in group studies for men and women. Visitors are always welcome. “What we share is real life — people working together to accomplish something bigger than themselves,” Brinkman adds. Spanish-speaking Sunday service, 7:30 to 10 p.m.
FOR MORE INFORMATION: Call 464.0440, 9 a.m.- 2 p.m., Monday – Thursday.